Rosh Hashanah (literally translated ”head of the year”) has come and gone again (Wednesday Night – September 4th, 2013), and once more I am reminded that it is a holiday that is more about your relationship with God than your gastronomic relationship with friends and family. Yes of course it is not a fast day like Yom Kippur, of course, but still the frivolity needs to be toned down a bit, and the attention placed on the fact that we are all being judged at this time of the year. So with that frame of mind, yeah too many early morning Selichot Services kind of kill the mood, my wife and I set out to make our menu and meals. After the LOVELY simanim, we enjoyed roasted fish, BL’s world famous teriyaki pasta, vegetables, and other things that I gobbled up, but forget now (this is what happens when I slack off on my blog)! Thanks so much to our hosts – may BL and ML and your entire family have a year filled with joy and happiness and success! The wine we enjoyed throughout the meal was the 2009 Elvi Ness Blanco, with enough residual sugar to make for a sweet but balanced year! This is the second iteration of this wine (2008 was the first year for this unique belnd). This wine is a 50/50 Moscato and Sauvignon Blanc blend, one that is not very common to me. The first time I tasted this wine, a few years ago, the wine was showing far more Sauvignon Blanc than the Moscato. Now, the wine is showing far more of the Moscato and the honeyed nose and mouth are screaming with pineapple and melon. The nose on this gold colored wine is screaming with rich honey, mango, fig, bright citrus, pear, melon, pineapple, floral notes, smoky toast, with a nice sweet and bright/tart nose to boot. The mouth on this full bodied wine is off dry to semi-sweet with more rich honey, bright citrus, pineapple, melon, mango, and pear. 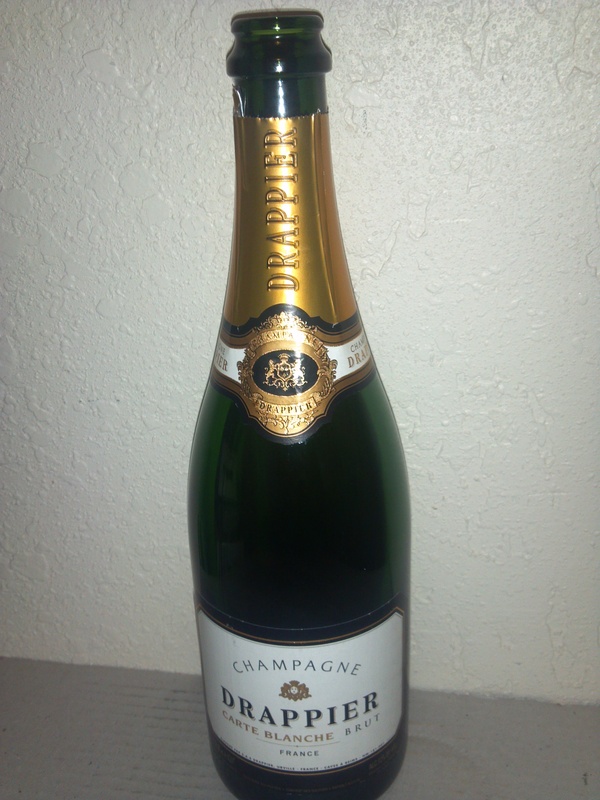 The mid palate is bright and acidic with toast, dirt, floral notes, honey, and fig. The finish is super long and spicy with rich mango, honey, pineapple, green tea, and toast. This is quite a unique wine and one I really enjoyed. This past weekend was still Passover and we invited friends and family to hang out and join us for a lovely meal. Passover is a time meant to represent rejuvenation, freedom, and the need for each of us to spark the embers of possibility that lie deep within us all. The combination of Passover and the Sabbath meant we needed to dig deep and make some really fun stuff, so that is exactly what we did. We made my favorite cut of meat, a brisket in the manner that we always do, with help from friends of ours that were hanging out with us for Passover. We also made other Passover favorites this year, including our Herb Encrusted Gefilte Fish Loaf, and a new vegetable kugel, that was killer. 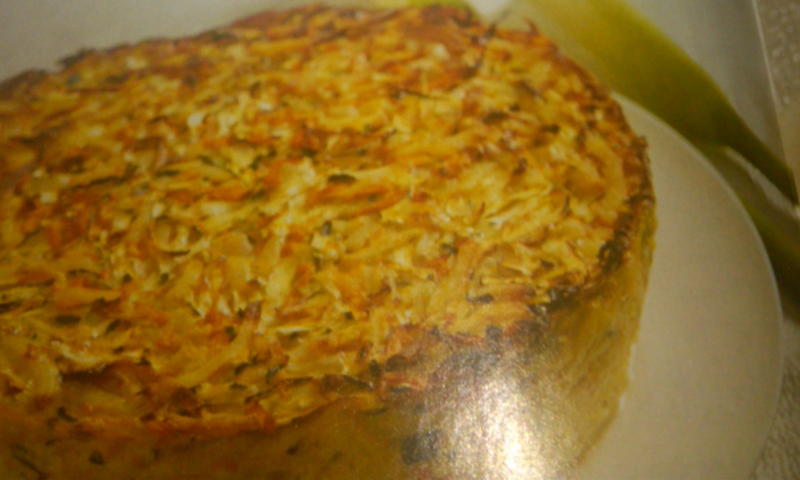 Most kugel has some kind of binding agent in it, and on Passover that is either Potato Starch or Matzah Meal. However, this recipe has neither! This is a slightly modified recipe from an insert we saw in a magazine created by the folks at the Pomegranate Supermarket in Brooklyn, NY. Preheat oven to 425 degrees. Grate all the vegetables in your food processor. Mix in the eggs, oil, salt, pepper, and garlic, and then pour into either a single 9″ x 13″ pan or two 9″ round pans. Bake at 425 for 30 minutes. Then lower the temperature to 350 degrees and bake for another hour. The kugel should be slightly charred on the top and sides but cooked thoroughly within, which is easy to check with a toothpick or fork. The recipes for the brisket and the Gefilte Loaf can be found here. We changed the brisket recipe only slightly, by NOT using ketchup, and using tomato sauce instead. To pair with this feast we had a few wines, some that people brought over, and some that we took out of the cellar. One of them is a rather unique wine, a blend of Moscato and Sauvignon Blanc. This is not a common blend and one that many dislike, but one that we really liked and one we spoke about previously, when we wrote an article about Elvi Wines. Jay Miller, a wine writer and critic for Robert Parker‘s highly influential Wine Advocate newsletter, echoed the words “Kudos to the Cohens (of Elvi Wines) for this remarkable array of Kosher wines…” when tasting the Elvi’s wines. 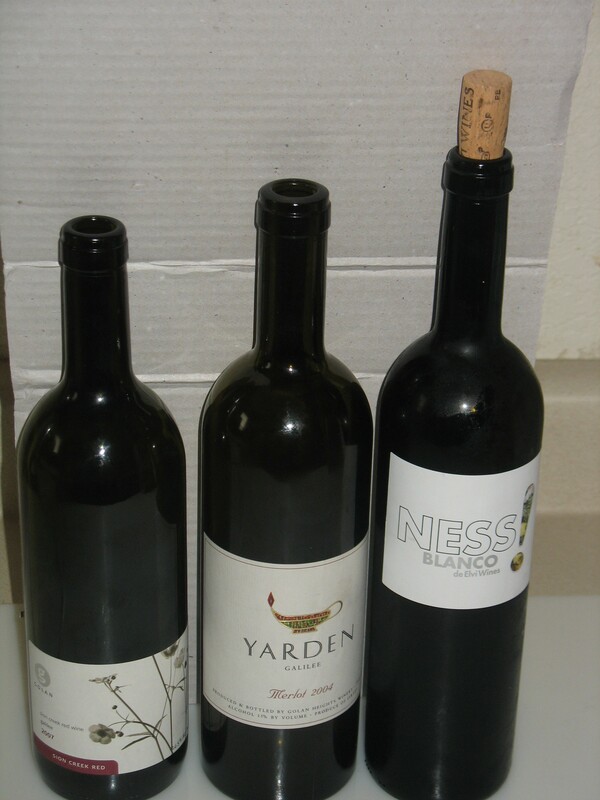 We have now tasted the wine in question a few times, the 2008 Elvi Ness Blanco, and each time it has put a smile on my face. Some critics did not like it, but Mr. Miller and I seem to like it just fine. This time around the wine is showing more Alsatian in nature, with rich honeyed styling and good minerality to boot. The wine went perfectly with the herb encrusted fish, the honey pairing well against the herb and the mineral notes pairing nicely with the fish’s slight sweetness and weight.